“SHOW ME THE MONEY! !” Making Yourself More Valuable in the Marketplace. A recent article posting on the Ultimate Patient Experience Facebook Page about the stagnation of hygienist’s salaries in the USA brought comments from hygienists here in Australia of similar instances. The article story raised the old chestnut about salary increases, and how they are given and how they are expected. Which to me raised a good question, a very good question. And that is, why are salary increases expected? You see, I’m not a big fan of salary increases based on anniversaries of starting date. Why should someone be paid more money just because they’ve chalked up another year at the office? What’s the logic in that? Why should someone’s salary be increased just because they just stuck around? Sure loyalty does play a part. And it is difficult and expensive replacing team members that choose to move on. Retraining, or training new employees is costly not only in dollar terms and time too, but also in terms of heart muscle and also stomach lining as well. I am certainly a believer in reward for results. I do believe that if business turnover is up, and also profits are up, then staff should be rewarded. No question. But I’d prefer rewards to be in the form of bonuses rather than salary. Bonuses as a percentage of increased profit. Bonuses that are set out in advance, in clear language, that are achievable, make great incentives for team members to help lift the performance, and therefore the results, of the business ..and that’s a win-win-win for everyone! The staff and team win, the business and owners win, and the customers win. On the flip side, paying in bonuses also allows for recalculations, or reductions, should the achievements of the previous year not be met or maintained. If increases in staff costs are granted as salary, then there’s no recompense for under performance in subsequent years. And that’s *NOT* good for business. As mentioned above, the best ways to reward and pay bonuses is to reward staff based on measurable metrics, like profit and turnover. Decrease in number of patients leaving without an ongoing appointment. Decrease in hygiene dead time. Decrease in dollars spent on consumables as a percentage of fees. Decrease in lab fees as a percentage of Crown and Bridge collections. Measurable parameters are what keep businesses moving forward. Watching the numbers, and trends on those numbers, can provide vital information as to the health of the dental business. Staff and team members focused on working towards regular improvements in those measurable numbers are certainly a strong asset for your dental business. On the flip side, one of my biggest gripes with dental staff and team members is when they confuse activity with achievement. Sure action is good. Better than inaction. But action without results, measurable results, is just motion. Nothing else. So when a team member seeks a pay rise, ask them for numbers. Results. What have they done to contribute to the health of the business, to the profits of the business, to the business’s bottom line? Don’t reward inaction. Don’t reward motion. Pay on results. Numbers tell the story. Look at the numbers. Remember that line? From the movie, Jerry Maguire? Reward measurable results. Nothing else! Is Your Office Signage Sending Out the Wrong Message? How’s the signage in your dental office? Well, how can this be so, Dr Moffet? Our signs are there to clarify our office policies, you say. John DiJulius said, “Don’t let the actions of the two percent dictate the rules for the other ninety eight percent”. Wise words indeed. Just because you have a recalcitrant two percent of customers, who disobey your practice guidelines and stretch the boundaries of your office policies and procedures, doesn’t mean that this two percent should dictate rules for the other ninety eight percent of your valuable compliant customers. Often we see signs in Dental Offices there that simply do the job that should be done by efficient and well-trained staff and team members. These signs are actually then used as a “crutch” for weak team members to lean on. They point to the sign, as if it is the *Golden Rule* that is set in stone and cannot be broken. Sadly, in a lot of situations, the signs are superfluous “clutter” that present a *Broken Window* to your customers that you and your team don’t even see. These signs are actually sending out negative subliminal messages that you as the business owner are totally unaware are happening. Let me share a few of my favourite signs. This sign, and variations of it, are usually office typed one page Word written signs. They are hung in the front office area and the financial coordinator’s office. But why? It’s like I said, because it’s on a sign, then that makes it official? I’d rather not see this nasty sign on display for every person in the office to see. What I’d rather see, when asked for credit, is that the front office team members all have the strength of character to look the customer or client square in the eye and say with a firm, but empathetic voice that the office requires full payment today for treatment. In fact, for new patients to the dental office, this matter of payment on the day needs to be addressed by the appointment coordinator at the time of scheduling the appointment. A note then needs to be made in the patient’s appointment file, so that this can then be added as a reminder during the confirmation call as well. Good notes that the new patient has verbally agreed and accepted need to be kept. Then there is no need to rely on this nasty sign. Dental credit and accounts for treatment are a throwback to the olden days that pre-date credit cards. In this modern day and age of electronic fund transfers there is no reason whatsoever that a dental office needs to act as a bank or loan office. Once again, in this day and age, dental offices need to bring themselves into the twenty first century. Look around at the world out there. Everyone is either on the phone or texting, or holding a phone. The mobile phone has become a human appendage, an extension of the person. Look at young people and their ‘fashion statements” with their phone covers? Firstly, as a dentist, I do draw the line on patients using the phone and texting while being treated in the chair. However, I don’t need a sign or rule displayed to offend the 99.9% of my clients who observe this courtesy. I’ve learned though, to never be annoyed or alarmed if a client’s phone rings in the treatment room during treatment. When their phone does ring, I simply ask, with a concerned voice, “Do you need to take that call?” and I’m ready to retrieve their phone for them if they respond in the affirmative. The surprising fact is that in nine out of ten cases, the patient will respond in the negative, that they don’t need to take the call. Often they will apologise for the auditory interruption of their phone ringing, and offer to mute their phone. I turn this into a positive for our office. When they say no that they don’t need to take the call, I’ll reply with an “Are you sure?” This puts me on their side, rather than making me an antagonist. It allows me to show a caring, warmer side. It allows me opportunity to share a tale about another patient who was waiting on or received an important call while getting treatment. It presents the phone ringing as not being any sort of interruption whatsoever. This scenario is really another great example of how your office can *Offer the Offer*. Offer the Offer is a process that I named for when there is kudos to be gained for offering an offer that is nearly always declined, but is no inconvenience whatsoever if accepted. The customer is delighted to have received the courtesy of the offer, rather than the content or component of the offer. This one is a doosey on so many levels. Firstly, the underlying message is, we will run behind schedule. It says, we don’t value or respect your time, and we do it so routinely, we have erected a sign to highlight this regularly occurring occurrence. Secondly, the sign heralds the fact that upon arrival in our office, you’re on your own. There is no greeter. No front office concierge. No schmoozer. This sign announces to the patients and customers that this office is understaffed. Understaffed for whatever reason. But understaffed none the less. Patients will naturally think, that with what they are paying for their dental treatment, the least this guy could do is employ someone here to greet me. That’s a given. All this sign does is herald the fact that on arrival at this office, you’re on your own. No wow factor here. It’s zero customer service. Credit card payments are money in the bank! Instant! It’s there same day or next day. No running to the bank to deposit cash or cheques. EFTPOS machines do daily settling and additions…it’s money for jam. So why put up a sign that makes you look miserly? Why not just incorporate the credit card fee into your fee structure without announcing to the world, and to each and every customer, that you are so tight fisted that you need to whack on an extra one point something percent? And when it comes to American Express, I’ve found that Amex Card holders make the better customers. On the whole, they accept and undergo more treatment. So look around your office. Are there signs there that really don’t add the customer service experience? Become a student of bad signage. It is all around us. Everywhere we do business. And it’s atrocious some times. Don’t become another sign displayer. It’s unnecessary. “Offer the Offer” is one of the many straight forward and easy to implement protocols and procedures that make up The Ultimate Patient Experience, a simple to build system I developed that allowed me to create an extraordinary dental office in an ordinary Sydney suburb. If you’d like to know more, ask me about my free special report. Stop Making Excuses! …Don’t Give Me: "But My Practice Is Different"!! I’m through with listening to dentists giving me excuses for their business inadequacies and failures. It’s amazing the list of reasons that doctors will come up with as to why certain things will not be successful in their business. Dan Kennedy quotes the businessperson’s safety net of “But my business is different”. This phrase is fallacious. All businesses are primarily the same. Dan will tell you that. They are all the same. All businesses rely on customers paying to receive goods or services of a certain value. The fee that the customer pays is a reflection on the quality of the good, the quality of the buying experience, i.e. the service, and the skill and the notoriety in the marketplace of the provider of the service. My thoughts are that this Kennedyism is a fundamental truism. All businesses *are* primarily the same. And for that matter, then, all dental offices are primarily the same. So why are some dental offices successful and others not? Larry Winget said something along the lines that you are exactly where you want to be; otherwise you’d change it. I think he said “You’re broke because you want to be”. Hard stuff!! Now you all know that as a dentist, I built a very successful dental office with high fees and high revenue, in a very ordinary part of Sydney, with average patients, on average incomes, living in average homes. This was not Beverly Hills CA. So how was I able to do this? I guess I was always motivated to create the best dental office that I could create. However, I became even more motivated after seeing a colleague’s office, some seventeen years ago, which was in a part of Sydney that was notorious for lower incomes and smaller homes than where I worked. This colleague had built a good quality dentistry office that back in 1996 had collections that were more than double those that I was collecting! And I thought that I was doing quite well!! This eye opening light bulb moment opened my eyes to the fact that I really needed to open my eyes. Because, if I was not open to seeing a different world, I could not create it. I told you recently about a good dentist friend of mine who I know who had difficulty in being accepted by the owners of a dental practice where he recently went to work. You see, that practice was “different”. According to the owner dentists. The people living in that area are “different”, my friend was told. I challenge that! I believe, at that practice, the doctors tend to only do whatever needs to be done to get the patient by. At that office, they liked to watch things. In fact, my friend said that their dental office had more watches than a Park Avenue TAG Heuer store! They liked to patch things. They had more patches than a pirate’s convention. You see, my friend was a high producer, and a pretty amicable, friendly sort of dentist. He was able to create rapport easily, but he was also pretty good at selling people the better dentistry that they needed. He preferred porcelain to patch ups. The trouble with selling better dentistry is that better dentistry comes with a higher fee….and that can shock some people/patients, who are lulled into a false sense of security by being patched and watched and patched and watched. Now, when it comes to treatment philosophies, I’m with my friend. I believe in offering only the best. No compromise! Doing the best. Giving the treatment that I would do for my sister, my wife, my mother or my daughter. And that’s been my mantra from that day forth. You see, I’d like my dentistry to stand the test of inspection by my peers. I’d like to know that I had done my best and given my patients what is best for them. I’d hate to be known as a patch up dentist because “my patients are different”. The other disadvantage of providing lower fee dentistry, is that it attracts customers with lower respect for their teeth and for your work and your training and skills. The best thing about doing your best dentistry is that it allows you to feel appreciated. And when you feel appreciated, and only when you feel appreciated, can you give exceptional customer service. It’s very hard to win over poor goods with great service. Your goods need to back up your level of service. It was with this quality of goods in mind that allowed me to build a great office on great customer service. The thing about great customer service, about Wowing your customers and patients, is that you need a solid foundation. Your customers are happy to pay for great service, and better quality. And these can be provided in any location. There are people who appreciate both….there’s no difference between businesses and locations and people. Remember, you are exactly where you want to be, otherwise you’d change it. So don’t make excuses. Don’t tell me “But my practice is different”. You can change it. And if you really want to, you will change it! “How to Not Be a Commodity” is just one of the many modules that make up The Ultimate Patient Experience, a simple easy to implement system I developed that allowed me to build an extraordinary dental office in an ordinary Sydney suburb. If you’d like to know more, ask me about my free special report. Does anybody love tax time? Every year I promise myself I’m going to keep on top of my receipts and statements, and every year I don’t. A business colleague who’s doing some work for me asked me a while back as to whether I was one of these people who did things in a structured sytstemised manner, or whether I was the kind of person who puts things off until, the last minute and then completes everything on the “deadline” moment? I have to say, sadly, I’m the latter. I am well intentioned, but I find, that if I allocate a task too much time initially, that it consumes more time rather than if I leave it to the last minute. My logic is, that leaving things to the last minute does not allow that task to steal time form future tasks. And hence, that’s exactly what I do. I’ve been known to still be packing my suitcase when the car arrives to take me to the airport. This is despite the fact that I always arrive at the airport three hours early to complete all security, shopping and lounge activities…. Go Figure!?!? Anyway, so back to tax time and back to today specifically. My accountant, who is very patient with me, sent me two emails, specifically to chase up two separate bank account statements, for the whole financial year that is now ten and a half months over. The first account was a company account held at ANZ Bank. This account was quite a busy account up to five years ago, but subsequent to my sale of Active Dental to Dental Corporation, I’ve pretty well not used this account much at all. So I rang ANZ, where I also do a considerable amount of personal banking. I have my primary working account there with them, along with a couple of mortgages and a credit card and have been a very long-term customer. I was able to connect straight away with a real live person, and after a short security procedure, this lady was able to provide me with what I exactly what I wanted. A quick update of my security question, update of my email address, and the encrypted statements should arrive in my inbox in one or two day’s time. Call number two was to Westpac Bank. Here I was after the statements for only one loan account. I have no other accounts with Westpac. Funnily enough, this loan was discharged for sure in a churn by my mortgage broker in 2010-2011 and replaced with an ANZ loan. So here’s what happened at Westpac Bank. Firstly, an eleven plus minute wait on hold with very poor quality customer messages throughout asking me to stay on the line. Eleven minutes on hold at a major bank is a big fail, especially as I was just on the phone to ANZ one of their competitors, and my call was taken pretty well straight away. If you’re company is not picking up on incoming calls straight away, what are your competitors doing? Do you think it might be wise to review your phone answering protocols, procedures and policies? Do you think that delayed answering and messages on hold are a turn on or turn off for your customers and clients, both existing and new, in business? How long, if at all, do you believe a client or customer should wait on the phone before the call is answered? So anyway, when my call was finally picked up by “Sal”, she apologised for the delay. But that’s all. I actually then told her that it had been a long time, to which she told me, that it was because it was a Monday morning. Now this was a lame excuse for two reasons. Firstly, it had ticked over to about 12:30pm Monday afternoon where I was, so just like the “pinch and a punch”, Cinderella had turned into a pumpkin at midday, and that reason needed to be retires to the top paddock. Secondly, sadly for Sal, she had no idea that I had called ANZ before and ordered my statements in way less time than I had been on hold. Now Sal could have avoided all this if she has simply asked a question or two of me like “How’s your morning been so far?” and I would have been able to share with her some serious information that would have prevented her from placing her foot in her mouth. Now one thing Westpac bank did for me while on hold was to ask me for my banking number….which caused me to have some serious doubts as to whether I’d be able to be served. Fortunately for me, a small book in a close at hand drawer that was over three years old, bore the required number, among others like it, that were now not of any use whatsoever. Back to Sal. Once I had informed Sal what I was after, she told me that she was unable to give me these statements as there was a permanent block on my account due to a security alert. I was able to recall this incident, as the security alert was sparked by me some time in the last year. As you do, I had called Westpac late one night and tried to activate a renewed existing Westpac Visa card. This had not been a successful mission. I had the card and no recent statement, so was not able to inform their [loosely titled] that night Customer Service agent of what my available credit was on that account. In the end, I failed the security checks, as his questioning was inflexible. In disgust I shredded the card. After all, there are many banks, which needs Westpac? So back to Sal. For me to receive a copy of these statements for this one Westpac loan account that has been discharged, I need to visit a Westpac branch with photo ID to reactivate myself, so I can be given the statements for this one account that has long been closed. I must say that Sal was sympathetic to my cause, but inflexible. Which was very disappointing. Something about identity theft? My motto, or mantra in this case would have been: “Firm in principle, flexible in procedure”. But maybe that’s just me? So now I’m off shortly to my local Westpac branch, passport in hand. I guess I’m my own worst enemy. Because, had I been diligent with received paper monthly bank statements in the first place, then I wouldn’t have ended up in this debacle that I ended up in today. But I have. Answer the phone quickly and promptly. Check back with the caller. Find out more about them band their day before launching into your protocols. Be firm in principle, flexible in procedure. Don’t be so black and white. Look for ways to reach out for someone, simply and easily. 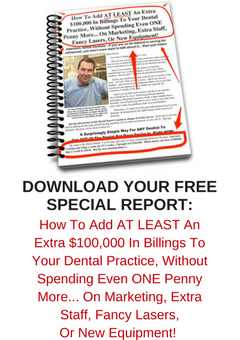 Look at this debacle and see how you can apply these lessons to your dental office. I learned very early in my adult life that nothing is ever final until the ink has dried. There were a number of incidences in my life to this point, some sad ones, that led me to this conclusion. As a young dentist, here’s one instance where I applied this principle…. When I left employed practice and purchased my private practice, I delayed giving notice to my employer because of my belief in the above statement. The main reason for this was that until contracts were exchanged in purchasing a practice, I believed that there was no need to jeopardise my employment while I was basically still “looking around”. And also, in this case, with my employer, we had a contract of employment that clearly stipulated two weeks notice to end the agreement. So when the time came to hand in my notice to him, after three good years of employment, sadly, that’s all the notice I gave. Regrettably I thought, in hindsight, that this was wrong. I should have given more. My parting with my employer was acrimonious. It could have been better. And it should have been on better terms. And I regretted not giving him more notice. I regretted for thirty and a half years. That was, until this week. You see what happened this week was this. There’s a dentist, who I know well, who had just recently, well five months ago, just started doing some part time work as a dentist, in someone else’s practice. This was new for him, as he had always previously worked for himself. But my friend had been looking forward to the new role. He was enjoying the relaxed atmosphere of being an employee, or contractor, and being able to hang up his drill at the end of the day and not have to worry about all the rigmarole and protocol of the running of a dental office…the bill paying, the HR, the payroll, the marketing….the list goes on. Well sadly, after five months in this new position at this new dental practice, things changed for my friend. You see, firstly, the practice started to go quiet, and so my friend’s employer decided it was time to let my friend go…Fair enough, but here’s what happened. My friend, the employed dentist, started to notice that his appointment book was looking thin. And upon closer examination, it appeared that no one was being scheduled with him, so suddenly, his patient pool was quickly drying up. You see, my friend had taken a week of leave. When he returned after this time, not one extra patient had been booked in to see him. Not a one. My friend said that although he wasn’t Nostradamus, he said he could see the writing on the wall. This was interesting, because as you remember from earlier, this was also my fear of what could happen for me all these years ago when I decided to leave employment and go into my own practice. The sad thing for my friend was, he had no contract of employment. No paper. No contract. Zero. Just a few words exchanged in trust. He thought that things would be OK. Yes, stupidly, he’d entered into this employment relationship without getting a word put down on paper. Now sure, words were said in principle, and there was a verbal agreement re terms of employment, like commission rate. But there was not much else said. And sadly there was nothing, nil, zero, about what to do when either party wanted out. My friend felt hard done by. After all, if he were a dental assistant, or a receptionist, or a hygienist, there would have been at least a week’s notice or a week’s pay in lieu. He asked his employer for some financial compensation. He got told, No. No money. Stiff. If I was going into employment in the future, here’s what I’d do. Get everything in writing. At least get a letter of agreement between both parties. Signed. Get something on paper. I’d make sure your agreement has something about what to do when the employment ends. Because, otherwise, it can and will get messy. Like Divorce, it’s a lot easier to finalise if there is an agreement beforehand. It’s very difficult to organise a pre-nup during separation. My friend is finding this out. So what sort of ending should you look for at the end of a term of employment? Here are my thoughts. Based on my memories of thirty years ago, and of my friend’s experiences. If the employed dentist wants to leave, he needs to give notice. At least 4 weeks, but I’d say eight. That’s only fair. As an employer of dentists, replacing a good assistant dentist in a short time is a very difficult process. If the employer wants to end the arrangement, he needs to give acceptable notice. I’d say ten weeks. And I’d say that the employer needs to guarantee the same patient volumes to the employed dentist during this period of notice, in both cases. And if he doesn’t then I believe the employer should pay the employee at the same rate that he has been earning during his employment. No ifs or buts. So either ten weeks good quality work, or ten weeks pay in lieu! No cutting off of patient flow by the employer. No cutting short of manpower by the employee. You see, after all, hopefully we’re talking about educated professionals working with each other. Not children playing in the sandpit. That’s how my friend felt. Next week we’ll cover the implications to both sides of having no written agreement…stay tuned…. What do you think my friend should do? What do you think the employer should do?